Franz Ferdinand, eldest son of Carl Ludwig, the brother of Emperor Franz Josef, was born in 1863. Educated by private tutors, he joined the Austro-Hungarian Army in 1883. His military career included service with an infantry regiment in Prague and with the hussars in Hungary. While in the army Ferdinand received several promotions: captain (1885), major (1888), colonel (1890) and general (1896). In 1889, Crown Prince Rudolf, the son of Franz Josef, shot himself at his hunting lodge. The succession now passed to Franz Ferdinand's father, Carl Ludwig. When he died in 1896, Franz Ferdinand became the new heir to the throne. Franz Ferdinand had first met Sophie von Chotkovato at a dance in Prague in 1888. The couple fell in love but although Sophie came from a noble Bohemian family, she was not considered a suitable woman to marry Franz Ferdinand. To be an eligible partner for a member of the Austro-Hungarian royal family, you had to be descended from the House of Hapsburg or from one of the ruling dynasties of Europe. Franz Ferdinand insisted he would not marry anyone else. Emperor Wilhelm II of Germany, Tsar Nicholas II of Russia and Pope Leo XIII all made representations to Franz Josef on Franz Ferdinand's behalf arguing that the the disagreement over Ferdinand's marriage was undermining the stability of the monarchy. In 1899 Emperor Franz Josef agreed a deal with Franz Ferdinand. He was allowed to marry Sophie von Chotkovato but it was stipulated that her descendants would not be allowed to succeed to the throne. It was also pointed out that Sophie would not be allowed to accompany her husband in the royal carriage nor could she sit by his side in the royal box. Franz Josef did not attend the wedding. Nor did his brothers or their families. The only people of the royal family who went to the ceremony was Franz Ferdinand's stepmother, Maria Theresia, and her two daughters. Over the next few years the couple had three children: Sophie (1901), Maximilian (1902) and Ernst (1904). 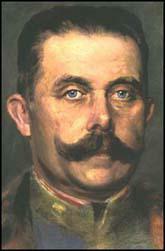 In 1913 Franz Ferdinand was appointed Inspector General of the Austro-Hungarian Army. A promoter of naval expansion and military modernization, Ferdinand was popular with the armed forces and in the summer of 1914 General Oskar Potiorek, Governor of the Austrian provinces of Bosnia-Herzegovina, invited the Inspector of the Armed Forces, to watch his troops on maneuvers. When Potieoek made it clear that his wife, Dutchess Sophie would also be made welcome, Franz Ferdinand agreed to make the visit. Franz Ferdinand knew that the journey would be dangerous. A large number of people living in Bosnia-Herzegovina were unhappy with Austro-Hungarian rule and favoured union with Serbia. In 1910 a Serb, Bogdan Zerajic, had attempted to assassinate General Varesanin, the Austrian governor of Bosnia-Herzegovina, when he was opening parliament in Sarajevo. Zerajic was a member of the Black Hand (Unity or Death) who wanted Bosnia-Herzegovina to leave the Austro-Hungarian Empire. The leader of the group was Colonel Dragutin Dimitrijevic, the chief of the Intelligence Department of the Serbian General Staff. Dimitrijevic considered Franz Ferdinand a serious threat to a union between Bosnia-Herzegovina and Serbia. He was worried that Ferdinand's plans to grant concessions to the South Slavs would make an independent Serbian state more difficult to achieve. When it was announced that Franz Ferdinand was going to visit Bosnia in June 1914, Dimitrijevic began to make plans to assassinate the heir of the Austro-Hungarian throne. Dimitrijevic sent three members of the Black Hand group based in Belgrade, Gavrilo Princip, Nedjelko Cabrinovic and Trifko Grabez, to Sarajevo to carry out the deed. Unknown to Dragutin Dimitrijevic, Major Voja Tankosic, a senior member of the Black Hand group, informed Nikola Pasic, the prime minister of Serbia, about the plot. Although Pasic supported the main objectives of the Black Hand group, he did not want the assassination to take place, as he feared it would lead to a war with Austro-Hungary. He therefore gave instructions for Gavrilo Princip, Nedjelko Cabrinovic and Trifko Grabez to be arrested when they attempted to leave the country. However, his orders were not implemented and the three man arrived in Bosnia-Herzegovina where they joined forces with fellow conspirators, Muhamed Mehmedbasic, Danilo Ilic, Vaso Cubrilovic, Cvijetko Popovic, Misko Jovanovic and Veljko Cubrilovic. at Sarajevo on 28th June, 1914. 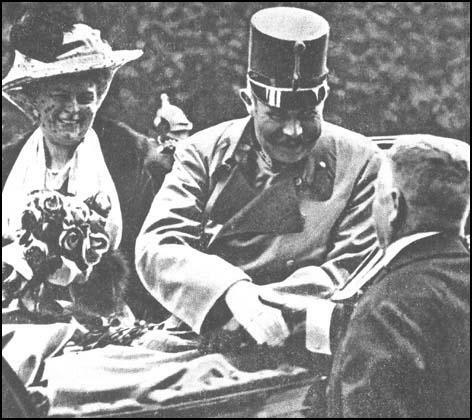 Just before 10 o'clock on Sunday, 28th June, 1914, Franz Ferdinand and Sophie von Chotkovato arrived in Sarajevo by train. General Oskar Potiorek, Governor of the Austrian provinces of Bosnia-Herzegovina, was waiting to take the royal party to the City Hall for the official reception. In the front car was Fehim Curcic, the Mayor of Sarajevo and Dr. Gerde, the city's Commissioner of Police. Franz Ferdinand and Duchess Sophie were in the second car with Oskar Potiorek and Count von Harrach. The car's top was rolled back in order to allow the crowds a good view of its occupants. At 10.10, when the six car possession passed the central police station, Nedjelko Cabrinovic hurled a hand grenade station at the archduke's car. The driver accelerated when he saw the object flying towards him and the grenade exploded under the wheel of the next car. Two of the occupants, Eric von Merizzi and Count Boos-Waldeck were seriously wounded. About a dozen spectators were also hit by bomb splinters. Franz Ferdinand's driver, Franz Urban, drove on extremely fast and other members of the Black Hand group on the route, Cvijetko Popovic, Gavrilo Princip, Danilo Ilic and Trifko Grabez, were unable to fire their guns or hurl their bombs at the Archduke's car. After attending the official reception at the City Hall, Franz Ferdinand asked about the members of his party that had been wounded by the bomb. When the archduke was told they were badly injured in hospital, he insisted on being taken to see them. A member of the archduke's staff, Baron Morsey, suggested this might be dangerous, but Oskar Potiorek, who was responsible for the safety of the royal party, replied, "Do you think Sarajevo is full of assassins?" However, Potiorek did accept it would be better if Duchess Sophie remained behind in the City Hall. When Baron Morsey told Sophie about the revised plans, she refused to stay arguing: "As long as the Archduke shows himself in public today I will not leave him." In order to avoid the city centre, General Oskar Potiorek decided that the royal car should travel straight along the Appel Quay to the Sarajevo Hospital. However, Potiorek forgot to tell the driver, Franz Urban, about this decision. On the way to the hospital, Urban took a right turn into Franz Joseph Street. One of the conspirators, Gavrilo Princip, was standing on the corner at the time. Oskar Potiorek immediately realised the driver had taken the wrong route and shouted "What is this? This is the wrong way! We're supposed to take the Appel Quay!". The driver put his foot on the brake, and began to back up. In doing so he moved slowly past the waiting Gavrilo Princip. 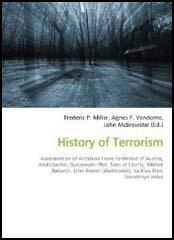 The assassin stepped forward, drew his gun, and at a distance of about five feet, fired several times into the car. Franz Ferdinand was hit in the neck and Sophie von Chotkovato in the abdomen. Princip's bullet had pierced the archduke's jugular vein but before losing consciousness, he pleaded "Sophie dear! Sophie dear! Don't die! Stay alive for our children!" Franz Urban drove the royal couple to Konak, the governor's residence, but although both were still alive when they arrived, they died from their wounds soon afterwards. Soph is a treasure, I am indescribably happy. She looks after me so much, I am doing wonderfully. I am so healthy and much less nervous. I feel as though I had been born again. The most intelligent thing I've ever done in my life has been the marriage to my Soph. She is everything to me: my wife, my adviser, my doctor, my warner, in a word: my entire happiness. Now, after four years, we love each other as on our first year of marriage, and our happiness has not been marred for a single second. Our hearts are full of happiness over the most gracious visit with which Your Highnesses are pleased to honour our capital city of Sarajevo, and I consider myself happy that Your Highnesses can read in our faces the feelings of our love and devotion, of our unshakable loyalty, and of our obedience to His Majesty our Emperor and King, and to the Most Serene Dynasty of Hapsburg-Lorraine. All the citizens of the capital city of Sarajevo find that their souls are filled with happiness, and they most enthusiastically greet Your Highnesses' most illustrious visit with the most cordial of welcomes, deeply convinced that this stay in our beloved city of Sarajevo will ever increase Your Highnesses' most gracious interest in our progress and well-being, and ever fortify our own most profound gratitude and loyalty, a loyalty that shall dwell immutably in our hearts, and that shall grow forever. It gives me special pleasure to accept the assurances of your unshakable loyalty and affection for His Majesty, our Most Gracious Emperor and King. I thank you cordially for the resounding ovations with which the population received me and my wife, the more so since in them an expression of pleasure over the failure of the assassination attempt. (5) Count von Harrach was in Archduke's car when he was killed. As I was drawing out my handkerchief to wipe away the blood from the Archduke's lips, her Highness cried out: "For God's sake! What happened to you?" Then she sank down from her seat with her face between the Archduke's knees. I had no idea that she had been hit and thought that she had fainted from shock. His Royal Highness said "Sophie, Sophie, don't die. Live for my children." I seized the Archduke by the coat collar to prevent his head from sinking forward and asking him: "Is your highness in great pain?" To which he clearly answered: "It is nothing." His face was slightly distorted, and he repeated six or seven times, every time losing more consciousness and with a fading voice: "It is nothing." Then came a brief pause followed by a convulsive rattle in his throat, caused by a loss of blood. This ceased on arrival at the governor's residence. The two unconscious bodies were carried into the building where their death was soon established. 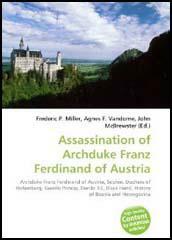 The Archduke Francis Ferdinand of Austria, nephew of the aged Emperor and heir to the throne, was assassinated in the streets of Sarajevo, the Bosnian capital, yesterday afternoon. His wife, the Duchess of Hohenberg, was killed by the same assassin. Some reports say the Duchess was deliberately shielding her husband from the second shot when she was killed. One victim was struck in the body and the other in the face; the telegrams are contradictory about which wound the Archduke suffered and which his wife. Two attempts were made on the Archduke's life during the day. He was in Bosnia inspecting the manoeuvres of the Austrian Army Corps stationed in the province, and had devoted yesterday to a procession through the capital. During the morning a bomb was thrown at the Imperial motor car, but its occupants escaped unhurt. In the afternoon in another part of the town a Serb student fired a revolver at the car, killing both the Archduke and the Duchess. We thought that only people of noble character were capable of committing political assassinations. We heard it said that he (Archduke Franz Ferdinand) was an enemy of the Slavs. Nobody directly told us "kill him"; but in this environment, we arrived at the idea ourselves. I would like to add something else. Although Princip is playing the hero, and although we all wanted to appear as heroes, we still have profound regrets. In the first place, we did not know that they late Franz Ferdinand was a father. We were greatly touched by the words he addressed to his wife: "Sophie, stay alive for our children." We are anything you want, except criminals. In my name and in the name of my comrades, I ask the children of the late successor to the throne to forgive us. As for you, punish us according to your understanding. We are not criminals. We are honest people, animated by noble sentiments; we are idealists; we wanted to do good; we have loved our people; and we shall die for our ideals.